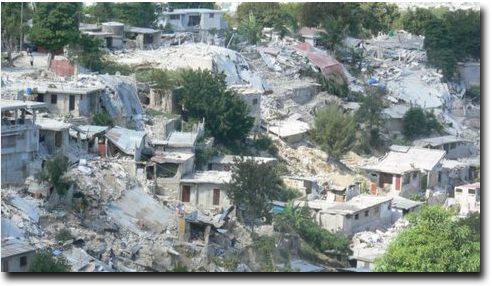 It's been almost seven years since we all saw images like this on our television screens of the devastation from the 2010 earthquake in Haiti. It was one of the greatest disasters we have seen in our life times. Many relief organizations flew into action trying to provide assistance amid the chaos. International donations were pledged in the billions - 9 billion to be exact. Yet very little of that money ever reached the poor in Haiti. Tent cities popped up around Port-au-Prince and many of them are still in existance. Many buildings around the capital are still just a pile of rubble. I know this may sound like grumbling but the truth deserves the spotlight sometimes. Thinking about this brought me back to the vision we have for ministry in Haiti. We have always felt that the Haitian people have a better idea of what they need and how to achieve it. The concept that "because they are poor we need to take over" does not work well there. Our national history with Haiti is not one that we as Americans can be proud of. Yet in spite of this fact, they are very gracious and thankful for the sincere help provided by those who care. My own journey into missions work was a long and windy road with a few detours. Over the years we sponsored children with various organizations and put their pictures on our refridgerators. You understand. It was a temporary scratch for an itch that God had given me years ago. Just at the right time we met someone who had the burden and the vision for his nation that we knew was lacking in so many outreaches. We have been working with Pastor Vragne Liberus for over 25 years now and have always felt the same passion and dedication that we first witnessed. His church is on fire with it. I hope you have a chance to experience it. Donated items can be also shipped through the same address. This shipping service is provided by "Mail n' more" to many Caribbean areas where the postal system is unreliable. Donations are not tax deductable.